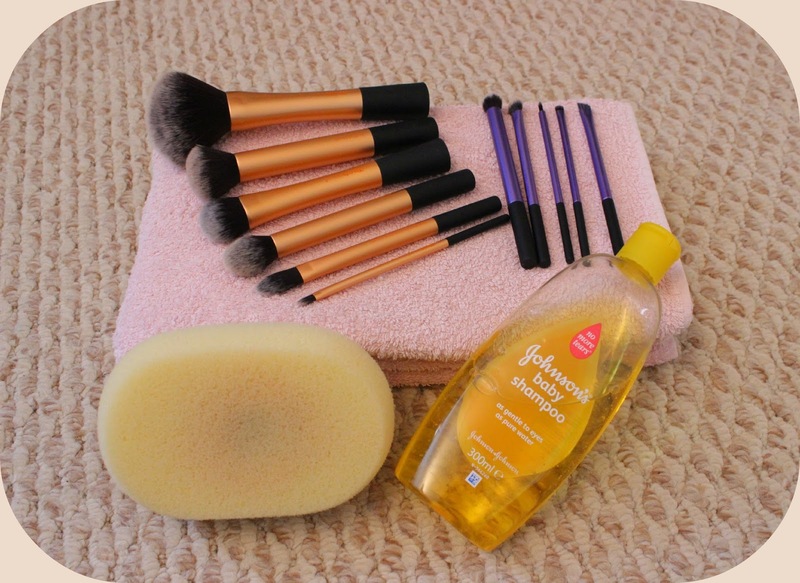 Quick & Easy Way To Keep Your Make-Up Brushes Clean! Ever noticed that your make-up isn’t going on as smoothly as it used to or that your skin is breaking out a lot more than normal? Having dirty makeup brushes could be the culprit! To avoid both of these problems you should wash your brushes at least 1-2 times a week. There are a few ways for can clean your brushes but this is the easiest that I have tried. So first off you’ll need to fill the sink or a bowl with lukewarm water if it’s too hot or too cold it can damage the brush. Once you have got your water you’ll need to soak the brush for about a minute or less depending on how dirty your brushes are, this starts to loosen the makeup off of the bristles. Make sure you don’t fully submerge the brush as this will loosen the glue that is holding all the bristles together. I clean my brushes with Johnson’s Baby Shampoo because it’s gentle and it won’t do any damage to my brushes. Most people wash their brushes against the palm of their hand but personally, I prefer using a sponge as it scrubs the brush and helps to remove every last bit of make-up. All I do is swirl my brush around the sponge to build up a slight lather but try to avoid making loads as it makes it difficult to rinse the brush out completely. … Then squeeze out any excess water. Next, you‘ll need to towel dry them, this gets out every last drop of water out of them and shortens the drying time. The final step is very important! Like I said in step one it can damage your brushes if you get water in the section where the glue is holding all the bristles together and the drying process is no exception. It would be impossible to get rid of every last trace of moisture from the bristles hence why it’s best to let your brushes dry upside down as gravity will do all the work of drawing the moisture away from the glue plus they go back into shape better! So there’s how to keep your brushes clean and in tip top condition! You can buy a bottle of make-up brush cleaner but they are usually rather expensive, so if you’re on a budget like me then this is perfect. PSST!! Get the Real Techniques Core Collection or Starter Kit for £16.49!! Plus single brushes are cheaper too!